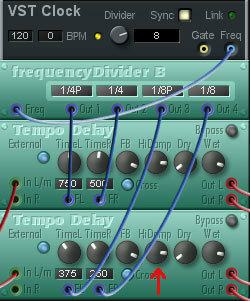 Modular module Tempo Delay have HiDamp control. Is it possible add LoDamp control in next release? Now need to made complex modular patch to achieve it. Need in Tempo delay because it can be controlled via VST Clock module via frequency divider, another delays want MIDI clock that works more unstable. You can choose the filter you like in the feedback path. But not controled by external clock. There is thousand simple ways to achieve what you want with modular ! Filter on input and filter on feedback path made some different thing -- on feedback path changed filter order for each next repeat, this thing turned simple DDL to musically valuable Delay. Now I have all I need with complex routing. There only wish for developers, may be they will add feature at Scope 6 or Modular V.